ATTENTION DEALERS AND BULK BADGE BUYERS! Substantial Deep Wholesale Discounts For Volume Purchases! Only $29.95 For One Or As Low As $15.95 Wholesale In Volume! We are happy to announce our high quality line of new authorized stock badges for 2008 from Thomas Badge Company. The famous name in investigative gear and products! These badges are NOT the cheap junk badges you see all over the internet! These badges are of a fine quality and heavy flat-back models. Many of the badges in the market place today are NOT flat-back badges and look like they have been stamped out of tin when you look at them close. These top quality badges are very heavy and impressive with baked enamel center seals and hand polished. They are professional grade badges you can be very proud of that will serve you for years to come. You can obtain them at substantial wholesale discounts when you order them in lots 0f 3, 6, 12 or 24 for your agency or dealer sales needs. You can order a set of three so you will have three different authorized titles to use when you need them at a substantial discount. These badges are in stock and ready for shipping. We have hundreds in stock! 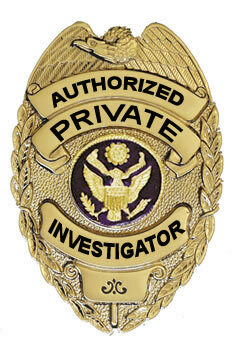 The new Authorized Private Investigator 2.5 inch badge with blue enameled center seal eagle is our most popular badge. It's only $29.95 and we know you will love it! This is a high quality heavy flat-back badge with quality pin back that will last for years. It's highly impressive and demands attention!You can even obtain them at substantial wholesale discounts when you order them in lots 0f 3, 6, 12 or 24 for your agency needs. 3 For Only $24.95 each! 6 For Only $19.95 each! 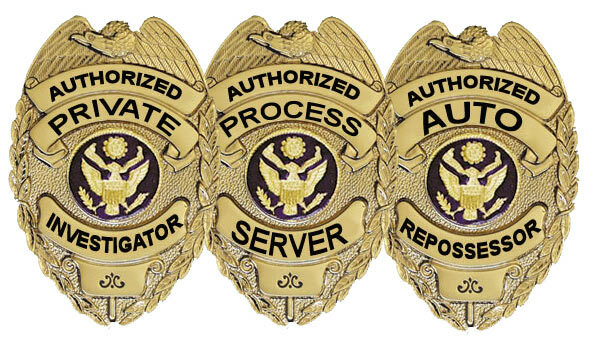 Our Process Server Badge ensures immediate recognition of the holder due to its large2.5 inch size. This is a reasonably priced badge with very high quality. This is a heavy-duty flat-back quality badge with quality pinback. Its enameled black lettering with federal eagle center seal and rich gold finish ensures years of trouble-free use. 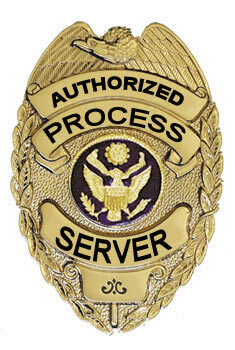 Our Process Server Badge also comes with a heavy duty pin & safety clasp. 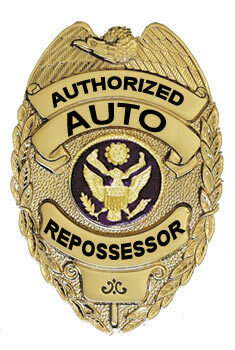 The new heavy-duty flat-back auto repossessor badge Will give you the attention you need when you need it. This high quality badge is a 2.5 inch size with fine backed enamel eagle center seal with blue background. This badge will serve you for years. Next day air and second day air shipping welcome! Other Badge Wallets, Badge Holders And Badge Cases!